Vanilla Reloads are the easiest cheapest way to load many prepaid cards. However, they are getting trickier and trickier to find at a store that will allow you to pay via credit card. CVS has the best track record for having them and being able to buy them with a credit card. Of the five local CVS stores in my area, I have been able to find them at four of the stores and I have only had trouble buying them with a credit card at one of the stores. Not everyone has CVS stores, or they live in a big city where the VRCs are always sold out. So, hopefully this page will help you find some hidden VRCs that you can buy. Finding Vanilla Reloads will take work. You need to do a lot of research and drive to all of your local stores, to see if you can buy them with a credit card. This is your duty if you are playing the MS game. The following stores carry them, however there are more stores that could sell them. 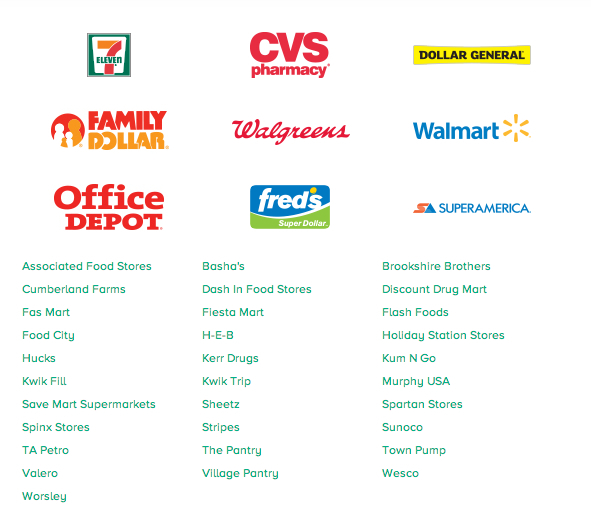 If you click on one of these stores on the Vanilla Reload website, it will bring you to the store locator for that company. What I did was click each and every link, entered my zip code and wrote down if any of those stores were near me. I went to each store that was in my area to try to find VRCs. I found them at every store on my list, however only a handful of them allowed me to buy them with a credit card. On my first run none of my local CVS stores even had them, so I asked the manager if they had any in the back and to my surprise they had an unopened pack that I could purchase. It is very important to check stores that aren’t on the list as well, because you never know where you will find them. I went to two gas stations not on the list that had the VRCs in stock, however both were cash only. At some stores “cash only” does not mean that you can not buy it with a credit card. It simply means either the store has a cash only policy or the employee just thinks it is cash only, when it really isn’t. If an employee tries to tell you that the purchase of a VRC is cash only, try to convince them to run it through just to see if you can use a credit card. Some store’s registers are hardcoded against allowing the purchase of VRCs with a credit card, however some are not. So, it is possible you will be able to buy it with a credit card if you can get the employee to at least try it. If you cannot get the employee to budge, try going to the store at a different time when someone else is working. Be nice. Never yell at an employee if they do not allow you to purchase it with a CC. You want to make friends in this game not enemies. You are much more likely to be able to purchase it when you are nice than when you are mean. To go along with the previous tip, try to make friends with the employees at the stores you frequent. They will see you a lot if you continue buying VRCs, so it is good for you to be on their good side. There is a nice guy named Jacob at my local CVS that always seems to find a few VRCs for me when I stop in. Is the store out of VRCs? Simply ask an employee if they have more in the back. You never know when they might. Find out when CVS or any other store that has them gets there shipments. You are more likely to find them on the day that CVS gets there shipment, than you are a few days down the road. You are definitely not the only person that plays this game in your town, I guarantee it. Call ahead. This only works if the employee knows exactly what card it is, which is another reason to make friends with the employees. If they don’t have them in stock, that will save you a trip and if they do, they can hold it for you until you get there. If you can absolutely not find them anywhere, I am sorry. That is very unfortunate. The next best thing would be to try the other methods of Manufactured Spending. You can still load your Bluebird at Walmart as well.